To ALL of our friends ~ THANK YOU for your friendship, love and support for our amazing TONY the TIGER who we miss SO MUCH. I imagine Tony is running and playing in the snow surrounded by festive pine trees…miss you so much ” T ” ~ Thank YOU for teaching us all so much about your world and how important it is for us to find our voice to help animals. 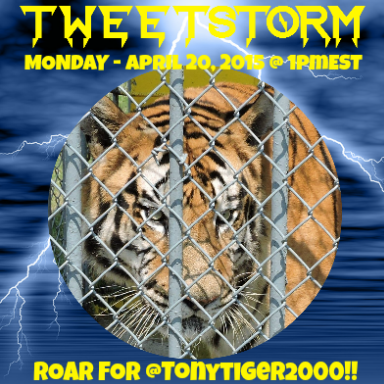 Apologies for the absence…recently I lost my own “little tiger” ~ my beautiful cat coincidentally named Tony. Back in 2008 a very good friend found Tony Cat’s adoption article in a local newspaper, (he was already named Tony by the shelter.) I read Tony’s story and once again felt fate brought me a very special boy. I adopted Tony Cat on September 3, 2008 and we shared almost 10 years together. I was truly blessed to know and share a life with this kind gentle soul. I like to believe my Tony Cat is with his “big cousin,” our beloved Tony the Tiger. There is not a day that goes by where I don’t think of Tony the Tiger…I love this tiger and I’m so thankful I got to visit him and tell him how much he was loved by his friends and how hard we were all trying to help him. What a beautiful, majestic boy. Tony truly was and always will be the ambassador for captive tigers – he was known world-wide, and raised tremendous awareness to the issue. I’m sorry Tony never got a wonderful sanctuary home. One again thank you for your support and understanding. Our legal battle to prevent the owner of the Tiger Truck Stop from obtaining another tiger continues. In the meantime, we are closely monitoring any developments at the Louisiana truck stop. Caspar the camel has taken the place of Tony the tiger — for now. With state laws preventing him from obtaining another exotic cat after Tony’s death in October, the owner of a landmark Iberville Parish truck stop says he intends to continue fighting for what he considers the tiger’s rightful successor. Animal rights groups have expressed adamant opposition, and the conflict is playing out in court. The camel came with another baby exotic animal: a coati, which is a member of the raccoon family native to South and Central America. His name is Cody and he’s two months old. A 2006 state law bans private ownership of large and exotic cats but Tony was grandfathered in because he had been living at the truck stop since 2001. In addition to giving people more reason to visit the truck stop, Sandlin said, the new animals at his site send a message to the groups that he believes have unfairly targeted him with false accusations surrounding the living conditions of his tiger exhibit, which opened in 1984. But the Animal Legal Defense Fund, a national organization that has taken the lead in legal opposition to Sandlin’s tiger exhibit, said replacing one animal with another doesn’t solve the problem. Tony was euthanized in October at age 17 after experiencing kidney failure. He had moved to the truck stop when he was six months old and spent the rest of his life there. Tigers typically live between 14 and 18 years in captivity. Sandlin spoke heatedly in an interview Saturday and firmly disputed the claims that Tony experienced a poor quality of life because of where he lived. “Are we going to start taking people’s children away if they don’t live in a mansion?” he said, acknowledging the differences between Tony’s enclosure and LSU’s tiger habitat while challenging the idea that one is humane and the other isn’t. Sandlin said the advocates fighting him in court are taking their arguments too far without reasonable consideration of the animals they purport to defend — arguments that members of the public and state legislators have taken to heart. A state judge is set to rule in coming months on the legality of Louisiana’s big cat ban in response to a lawsuit from Sandlin, which holds that the ban is unconstitutional. Attorneys for the state and the Animal Legal Defense Fund maintain it’s legal. The 2006 law forbids anyone other than colleges, sanctuaries, zoos, wildlife research centers and scientific organizations from possessing big exotic cats. 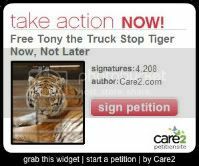 That case is the latest of several over the past decade as animal rights groups sought to get Tony removed from the truck stop because they believed he wasn’t receiving adequate care. Sandlin is hopeful the judge will rule in his favor. But he is also willing to branch out with other animals in the meantime, in part to maintain his license that allows him to keep exotic animals of any kind. Sandlin said Caspar is a name of Persian origin that means “keeper of the treasure” — which he said could refer to the camel’s role in holding down the tiger enclosure until the business is graced with another striped predator. Tony, a majestic Siberian-Bengal tiger, spent 17 years in a cage as a roadside attraction in the parking lot of a Louisiana gas station called the Tiger Truck Stop. The Animal Legal Defense Fund filed multiple lawsuits in an effort to get Tony moved to a sanctuary. 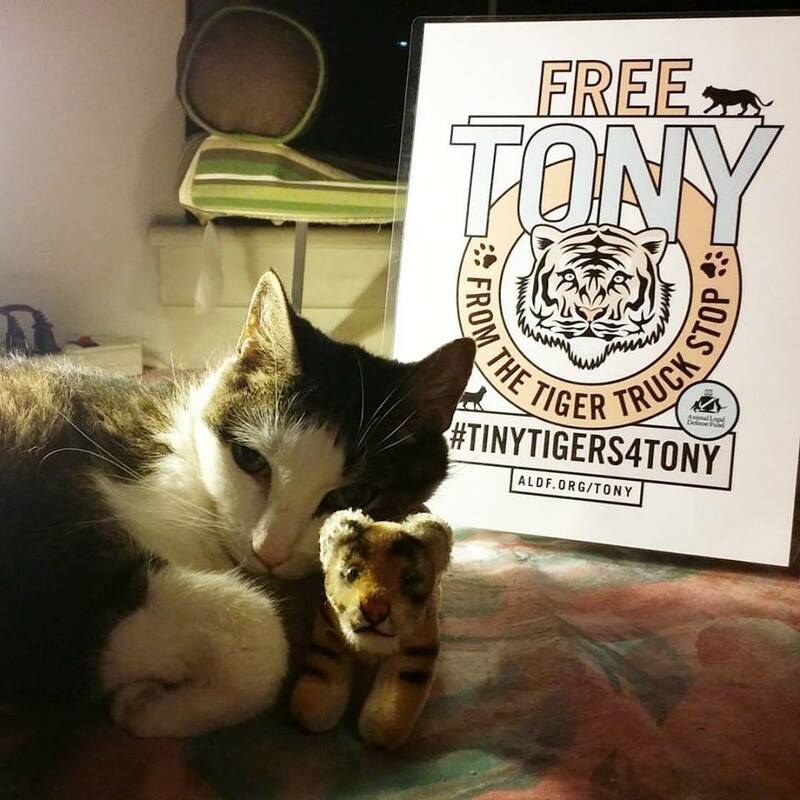 But Tony died while still trapped at the Tiger Truck Stop before these cases were resolved. 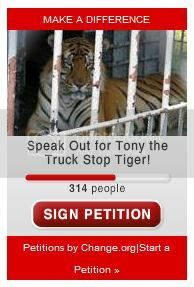 Michael Sandlin, the owner of the Tiger Truck Stop, has made a business of exploiting tigers like Tony for decades. He was cited for violating the Animal Welfare Act by the U. S. Department of Agriculture (USDA) repeatedly — and was forced to give up all of the tigers in his custody except one: Tony. We hoped Tony would be the last — but Sandlin is attempting to obtain more tigers — and we need your help to stop him. Please sign our petition now demanding that Michael Sandlin give up his efforts to obtain another tiger. A truck stop is no place for a tiger. In the wild, these animals range over hundreds of miles, living in a diverse range of habitats that include grasslands and tropical forests. And though most can’t be returned to the wild after captivity, they deserve to live in sanctuaries that provide extensive space, a natural setting, and the enrichment they need to stay healthy. It is clear that the Tiger Truck Stop cannot provide an adequate home for a tiger. Don’t let another tiger suffer like Tony did. Can I count on you to add your voice to this important fight? Sign our petition today and tell Sandlin that a truck stop is no place for a tiger! Tony the tiger was forced to spend his life in a chain-link cage at a Louisiana gas station, until he was recently euthanized because of his failing health. He was 17 years old and had spent nearly his entire life imprisoned at the truck stop. It’s too late for Tony, but it’s not too late to help other big cats who are languishing in private homes across the U.S. In nature, big cats often have home ranges of hundreds of miles, where they have the opportunity to roam, swim, climb, hunt, choose their mates, and raise their young. But in private homes, they suffer in cramped cages and barren enclosures, where they’re denied everything that’s natural and important to them. Wild animals belong in the wild, and when these dangerous apex predators are confined to private homes, the consequences can be fatal, and there have been hundreds of dangerous incidents in the U.S. since 1990. 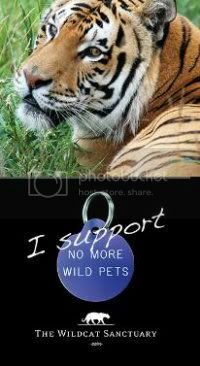 To help end the private breeding and possession of tigers and other big cats, please use the form at: https://support.peta.org/page/3654/action/1 to let your members of Congress know that you support the Big Cat Public Safety Act (H.R. 1818), which would bring an end to private ownership of dangerous wild cats, safeguarding both wild animals and communities across the U.S. You can check to see if your representatives are already cosponsors of this bill by clicking here. Please feel free to customize the letter, thanking them if they’re already cosponsors or asking them to sponsor it if they aren’t.